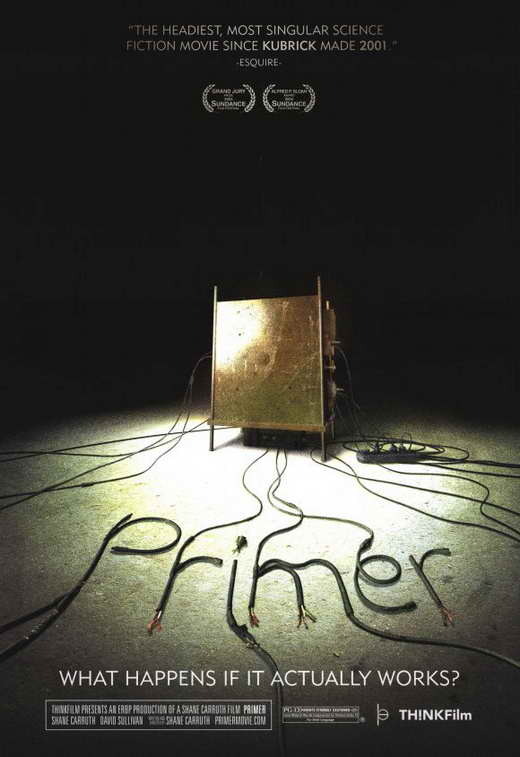 Primer is an elegantly thoughtful science-fiction meditation, which resuscitates the normal convention of this form of fiction of the malfeasance of man with his handling of a profound technology he did not even know he had the potential of conceiving. Granted, not all science fiction holds this posture, but it is routine for it to do so; to give the audience a feeling of anxiety, and an under-handed distrust in their own humanity when given more power then what they can handle. It is an interesting phenomenon then; how common this distrust is within humanity while simultaneously there is an outward political reflection on the assurance of mankind being led into Providence by those who are more trustworthy of such power. In any case, Primer does a wonderful, uncanny job of presenting a sense of rawness to superhuman technological discovery. It is prescient in its handling of genuine start-up sweat equity in the early goings of the film. And for this alone the film is worth watching. No doubt this was a script that was written pre-Millennium, as the focal point of hardware technology for disruptiveness, which was the only opportunity for the scientifically minded audacious man to strike gold, is used rather than an information technological ploy. Also positively, the narrative itself is contingent on the hardware disruptiveness; it would be incredibly challenging to replace the accidental discovery with software in the story. What makes this segment of the story worth watching is in its picture-perfect accuracy in portraying the stereotypical character of the high-tech startup. These are youngish men, in unsurprisingly stable jobs (even managerial roles), utilizing the scarcity of their grasp of scientific knowledge in the labor market yet who see the opportunity of harvesting an even richer yield. It is this grinding, in the garage after-hours, which is un-glorious and demystifying for those with delusions of grandeur on what it means to start a company. And yet, despite the seldom appreciated intelligence and savvy required to be a success, there always is a fatal conceit present in a failure to bring a new technology to market. Perhaps the fact every human has a flaw or a weakness may be the most presentable argument in favor of the stroke of luck an entrepreneur has in getting their business off the ground. That, they do not succeed because of their efforts but in spite of their flaws. And it is this juncture which provides a novel approach to science fiction inconceivable before the “start up” became a part of the zeitgeist. That, the pair of kindred spirits discover a profound technology and instead of deploying it for the greater good, they have a petty desire to use it, or rather abuse it. It is not worth spoiling what the abuse is, only that it is used as a form of revenge, or rather retaliation, against an investor who turned a thumb downward to their potential to achieve. Such an egotistic lashing out dooms the pair, disappointingly so. The havoc they create for themselves never needed to be if they possessed a sense of self-restraint; and yet, this is the succor of Christianity. How often is man presented with an ability to rear his lower form when instead he can raise himself higher if only he had a sense of control over his self? It is such a commonality, such a constant of life which many find empathy in reveling in. That the potential of being a higher man is nice, yet perpetually difficult to reach without the aid of God. In final then, perhaps a serious religion amalgamated with high technology provides the road to salvation so sought after?